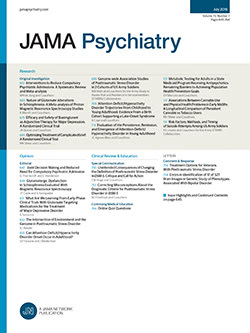 • Evidence from outcome studies of major depression indicates a high rate of relapse and chronicity, and that prior chronicity, recurrent episodes, and the presence of psychosocial stressors are associated with a poor outcome. However, the generalizability of these findings is limited because most studies have focused on treated samples; thus, these studies may have been biased toward more chronic or severe illnesses. In prospectively surveying a large probability sample of the general population, the Epidemiologic Catchment Area program offers the opportunity to investigate prognosis without selection bias. In this study, the Epidemiologic Catchment Area subjects with a diagnosis of Major Depressive Disorder at first interview (n = 423) were categorized according to their diagnostic status 1 year later. The results confirmed a high rate of nonrecovery, with clinical features associated with a poor outcome that resembled those identified in previous clinical studies. Overall, clinical factors were more important prognostically than were sociodemographic characteristics. However, there was some evidence that a poorer outcome in older women may partially explain the greater female prevalence of depression in the community.